Few public gardens have had such an enduring influence on American camellia history as the world-famous Bellingrath Gardens near Mobile, Alabama. Ever since its 1930’s opening during the rise of America’s fascination with camellias, it has topped many lists of attractions in the nation and has hosted the American Camellia Society for tours and meetings more than any other garden in the nation. 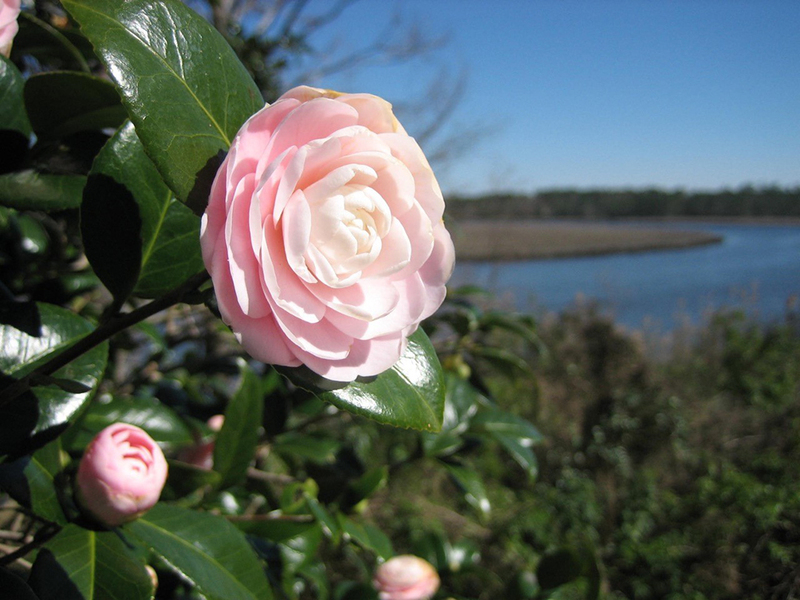 In 2008 it was an inaugural selection as an American Camellia Trail Garden. Bellingrath Gardens is an enchanting scene of flowers and fountains along curving trails beneath moss-draped live oaks and magnolias. Blooming year round, it is best known for its dramatic display of camellias, azaleas, roses, hydrangeas, and chrysanthemums, which grow in profusion on the 800-acre estate. A major focal point is the Bellingrath Home, completed in 1935, with quaint courts and porticoes accented by iron-lace grille work representing the influence of old France and Spain on the American gulf coast. For 40 years Bessie Bellingrath collected antique furniture, priceless silver, fine china, and rare porcelains which are on public display in the home. A modern addition is the Boehm Gallery, one of the largest collections of Boehm porcelains in the world. Visitors who wonder at the beauty of the gardens know little of how it evolved as a love language between Walter Bellingrath and his talented wife Bessie. 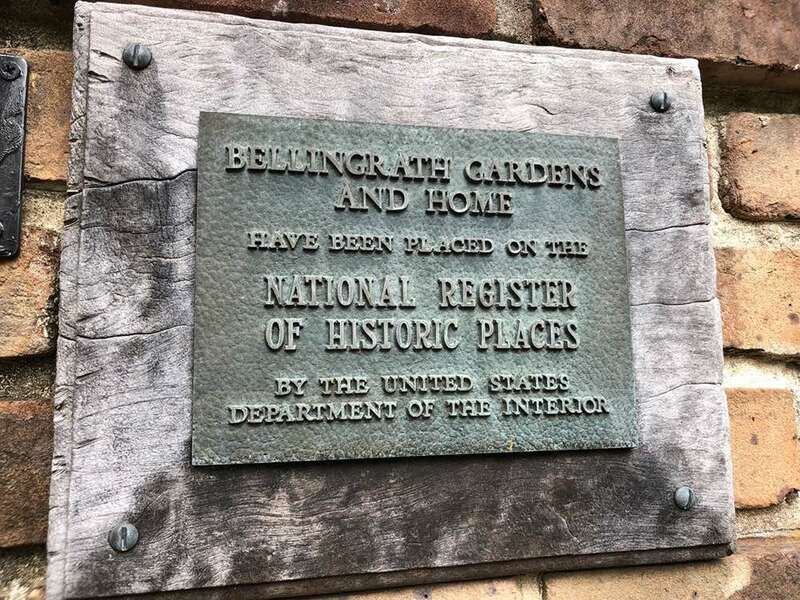 Walter is rightly credited with developing Bellingrath Gardens over time, but it was Bessie’s dream that inspired the transformation of this once modest fish camp into today’s great public garden. In 1917 one of Coca-Cola’s early entrepreneurs, Walter Bellingrath, acquired 60 acres of riverfront near Mobile Bay. It previously was the site of an old sawmill overlooking a bend in the beautiful Fowl River, named by early French settlers Isle-aux-Oies, meaning Isle of Geese. Fishing on the river was first-class, as it remains today, and Walter delighted in inviting friends, family and associates to his "Belle Camp" retreat. A year later Bessie began planting azaleas and camellias to brighten the scene. As the garden grew in size and beauty, Bessie and Walter traveled to visit some of Europe’s famous gardens in 1927. Returning home, they recruited an American architect, a French gardener, and an English landscape engineer to begin designing and building their beautiful home and garden. Economic times were hard in the 1930s, and one of Bessie’s quiet ways of helping people was to travel the gulf coast in search of large azaleas and camellias, offering to pay too much. Finding one, she would stop and tell the owners she was looking for that particular variety, and that it had been hard to find, when often it was very common. She would leave a check for hundreds of dollars, at a time when few families earned more than $25 per week. Scores of stately camellias, many a century old, were moved into Bellingrath Gardens. They filled acre upon acre, often arriving on Coca-Cola delivery trucks. One Sunday in March 1932 the couple decided to hold an open house. The response was beyond their imagination, as cars seemed to stretch the entire 20 miles from Mobile. Seeing such great interest, the Bellingraths devoted their energies developing a grand public garden of European scale. It opened year round in 1934. The Greyhound Bus company added a round-trip route from Mobile to the Gardens. From thousands of annual visitors, a generation of new camellia enthusiasts was born. 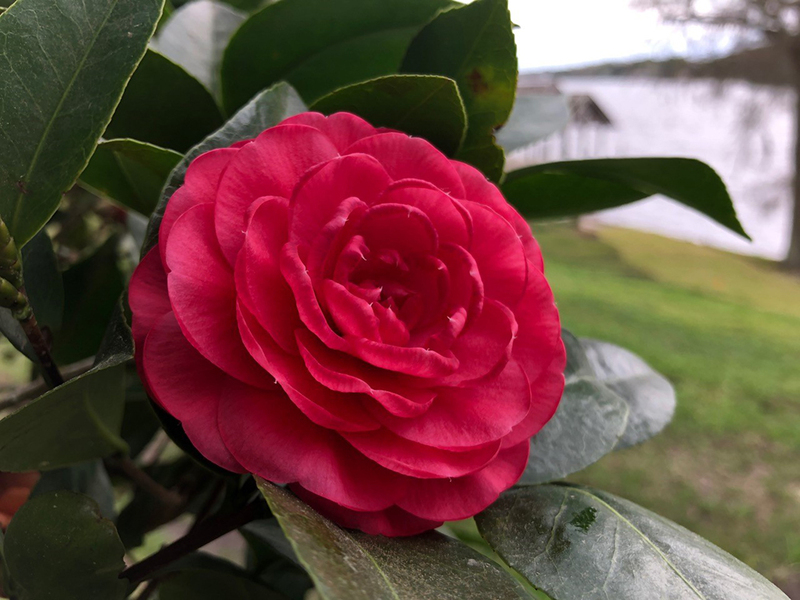 New camellias were named to honor the Bellingraths, among them ‘Queen Bessie’ by the great Alabama nurseryman, K. Sawada. Walter forever credited Bessie’s genius for the creation of Bellingrath Gardens. After her sudden death at age 64 in 1943, he devoted the rest of his life to perfecting the Gardens she worked so hard to create. “These Gardens were my wife’s dream,” he said, “and I want to live to see that dream come true.” He placed the gardens in a permanent foundation in 1950 and died in 1955, two days after his 86th birthday. “Mr. Bell,” as he was known to his friends, was especially fond of camellias and he frequently referred to them as the “aristocrats of flowers.” He loved to tell where and how he or Bessie acquired their various treasured specimens. At the time of his death, Bellingrath Gardens had an estimated 2,000 mature camellias of over 400 varieties. A Camellia Parterre displaying 100 specimen plants was staffed by employees whose job was to remove all spent blooms daily and who were trained to personally identify each variety for visitors, as Mr. Bellingrath disliked the idea of signs marring the natural scene. In the later years of his life, Walter Bellingrath had often expressed a desire for more and more camellia varieties. Thus, following his death some of his camellia friends in 1956 had the idea to honor his memory by adding a new camellia arboretum adjoining the original gardens. They selected a seven acre wooded area with good yellow pine cover. In the winters of 1957-58 some four hundred field-grown specimens ranging in age from 5-10 years were set out, and 400 grafting stocks of 5-year old ‘Professor Sargent’ were planted and grafted. The arboretum soon grew to over 1,200 plants of about 900 varieties, situated along grass-covered trails overseeded with rye grass in winter. It was a showcase of finer camellia specimens dedicated to the general stimulation of interest in camellias. Personal accounts of the famous camellia arboretum defy description, and photographs hardly capture its grandeur. Alas, the year 1979 brought devastation when the entire garden suffered a direct hit from Hurricane Frederick. The combination of high winds and falling trees wiped out hundreds of camellias and azaleas. One of the great losses was the camellia arboretum, flattened by the once majestic tall pines. The gardens closed for a year during the clean up, which required extensive replanting and rearranging. Fortunately many of the arboretum’s prized camellias were able to be saved and moved into the main garden. Now, forty years later, the old cliche ‘addition by subtraction’ applies to the lost camellia arboretum. The old ones which survived were nursed back to health by the Garden’s late manager Pat Ryan, a leader in the camellia world, who hosted the ACS on many occasions. 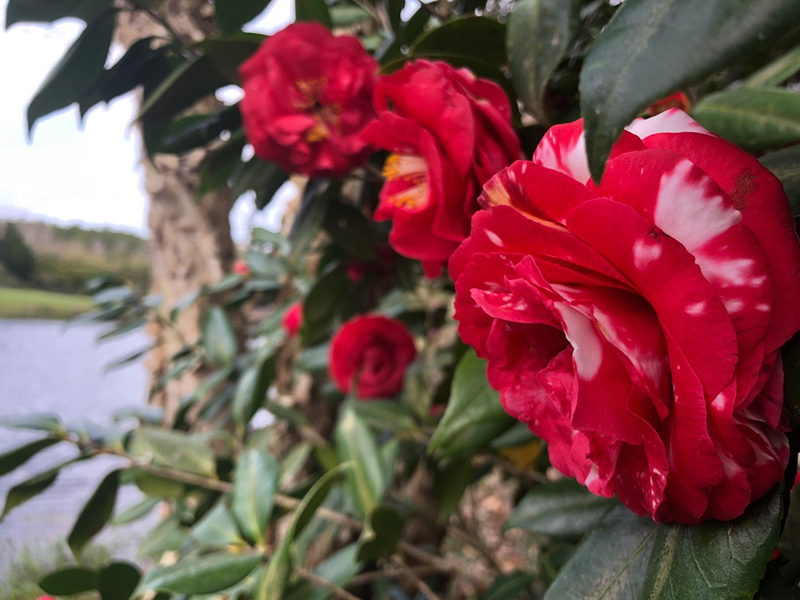 In recent years those original camellias have been joined by many new ones under the expert supervision of current Director Dr. Bill Barrick, himself a camellia enthusiast. Each year, under Dr. Barrick’s personal supervision, a number of outstanding new camellia varieties has been added, keeping the collection current. Camellias are a lifelong fascination of Dr. Barrick, a renowned horticulturist who has been President of both the American Horticultural Society and the American Public Gardens Association and is a recipient of the AHS’ highest honor, the prestigious “Liberty Hyde Bailey Award” given annually to an individual deemed to have made significant lifetime contributions to horticulture. 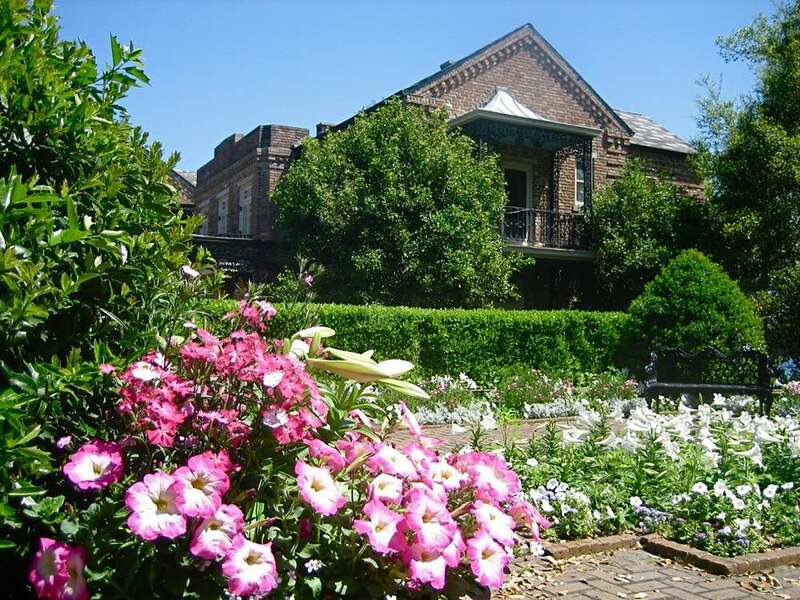 Dr. Barrick is widely credited with restoring Bellingrath Gardens to its former glory. 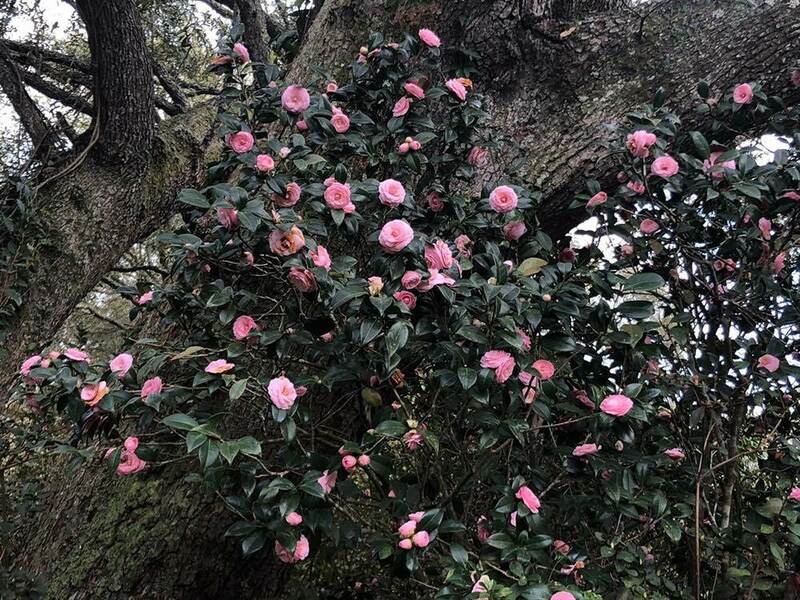 Bellingrath Gardens today features one of the best camellia collections to be found anywhere. 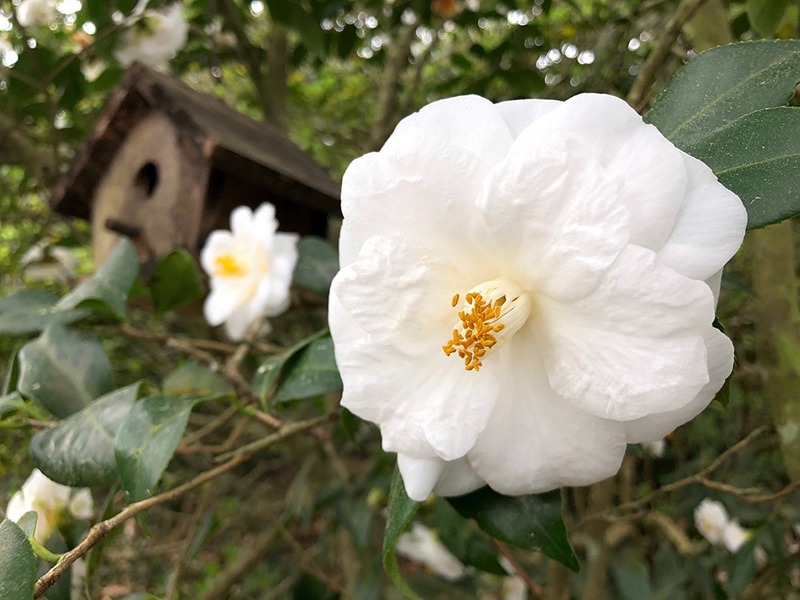 It will again be one of the feature gardens for the 2019 Annual Meeting of the American Camellia Society, which coincides with Alabama’s celebration of the 60th Anniversary of the Camellia as its official State Flower.